You have had your share of troubled waters this year. I appreciate your honesty. I feel we sometimes hide this side but it's important to share the frustration and the loss of faith. Keep your head up. I hope your waters will smooth out soon. May God continue to bless your life. May He keep guiding you through troubled times, remind you of the good things that still remain, and help you grow in faith and trust. Thank you for sharing from your heart. I hope our heart feels a bit lighter because of your honesty and openness. Your words, as always, have blessed me. Wow, it sounds like a very challenging year. I'm sorry you've gone through so much! I'm with you: choose a less stressful word for the new year! Like "calm" or even "boring." :-) Seriously, though, these are the years that bring the most growth, often. It sounds as though ultimately, you flourished! Wow! I'm glad you shared honestly. It's so real; the way life is. And I know you will come out refined gold. I love your poem too. This post reminds me of a stubborn dandelion, insisting it will grow in the sidewalk crack--and flourish too. Donna, you know that I am with you in prayer and friendship. 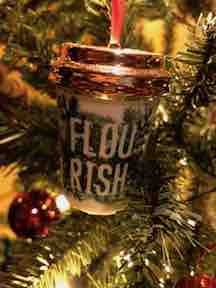 Flourish has been with you. Think of this year as your time to shovel up the muck and still flourish in the midst of challenge. Your new house and lifestyle are a witness that you made it through the muddle. The road from your old world to your new world may not be the easy route but think of the possibilities that await. I always find it difficult to uncover the gold when the mud is knee high. Your poem is lovely and I think it could be an evening prayer. Donna, the last unknown is me-Carol Varsalona. My emails are getting mixed up. I posted for SP1stT early this morning: http://beyondliteracylink.blogspot.com/2018/12/reflecting-on-my-one-word.html.